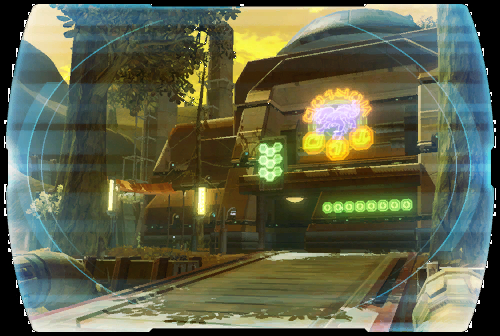 Like the palace of Nem'ro, Fa'athra's palace is modeled after the capitol building in the Hutta city of Bilbousa. Unlike the palace of Nem'ro, Fa'athra's home is a veritable deathtrap--built with warfare and defense as its primary purpose, rather than business and luxury. Fa'athra employs several different mercenary groups to patrol the palace grounds and corridors. Each mercenary organization is given information only about its own territory and has no information about the rest of the palace's defenses. Fa'athra's paranoia guarantees that no single betrayal can cause his downfall, but it may also be his greatest weakness. Outside the settled and industrialized sectors of Hutta are the swamps--land occupied only by the desperate and foolhardy. Mutated animal life and crazed bog people are a threat to all ground transport; the Hutts normally travel by air, leaving their humanoid servants to move by foot or landspeeder. Swampland covers nearly half of Hutta's surface, uninhabitable by galactic standard due to the level of pollutants in the water and air. This wasn't always the case--before the Hutts migrated to the planet, most of what is now swampland was jungle and ocean. Over centuries of intentional planetary engineering and simple neglect, however, the jungles died and the oceans were drained and chemically converted. Hutts are notoriously territorial creatures, and their settlements reflect this. Enormous urban centers inhabited by thousands of Hutts are few on Hutta; instead, the planet's industrial towns are scattered across the globe, ruled like city-states by whichever Hutt rises to the top. Jiguuna is one such industrial town, serving as an operational hub for nearby factories, mines and processing centers. Booming and influential two centuries ago, Jiguuna fell into anarchy when its founder, Bakuush the Hutt, died in a mechanical accident. Afterward, Jiguuna's population of humanoid enforcers, workers and slaves fought for scraps under a succession of would-be ganglords. Eventually, a Hutt called Nem'ro eliminated his competitors and declared himself Jiguuna's new ruler. Since then, Jiguuna has been on an upswing, facilitating the distribution of shvash gas, spice and weapons. Competition with neighboring Hutts has brought gang warfare back to town, but business goes on, and Nem'ro controls the locals with bribes and brute force. The palace of Nem'ro the Hutt is half-fortress, half-monument-to-hedonism. Anyone who does business in Jiguuna is expected to come to the palace and pay his or her dues, but Nem'ro himself stays hidden behind multiple layers of security; most visitors are lucky to speak to one of his lieutenants. Still, a visit to the palace has its privileges. In addition to the fully stocked cantina and the right to socialize with traveling traders, pirates and businesspeople from across the galaxy, the pleasures of the fighting pit and the private suites await those of a particular temperament. Murder and theft aren't unknown in the palace, either--but acts performed without Nem'ro's blessing can have gruesome repercussions. The facilities at the Old Muckworks process the enormous quantities of chemicals and liquid pollutants in the waters of Hutta. Unfortunately, this "processing" doesn't necessarily clean the water. Although the facilities do prevent the planet from becoming entirely lethal to non-Hutt life, their primary job is to filter any valuable compounds from waste dumped into the swamps. These compounds are drained into enormous factory vats. Whatever useless chemicals remain afterward go right back into the swamp water. The original Jiguuna Muckworks was replaced by new Muckworks--built some distance west of town--several decades ago, but the successor facility went into critical failure shortly after its installation. The "Old Muckworks" returned to use, and the name stuck. The Rust Yards, according to common wisdom, are where old industrial facilities go to die. Over the decades, many factories have been constructed, operated and run into the ground here--only to be rebuilt and repurposed. Ore refineries become droid recycling plants when the ore supply runs dry; weapons assembly lines become toxic chemical storage bays when the arms dealing business is slow. Nem'ro the Hutt has traditionally controlled the businesses in the Rust Yards--never by official contract, but by virtue of having the largest armed force in the area and by coaxing plant foremen into cooperating. Recent brutal attacks have shifted control of the Rust Yards to Nem'ro's rival, Fa'athra, who keeps the area locked down with his own mercenaries and security droids. The local workforce has little choice but to cooperate.